there is precious diamond dust inside this chocolate bar! small crystallized bits of ginger crackle and meld into the bittersweet chocolate. i recommend always having this bar on hand. frankly i had a little difficulty in tasting this hot cocoa... the morsels barely made the milk since i kept eating them one after another - - - they were absolutely delicious. 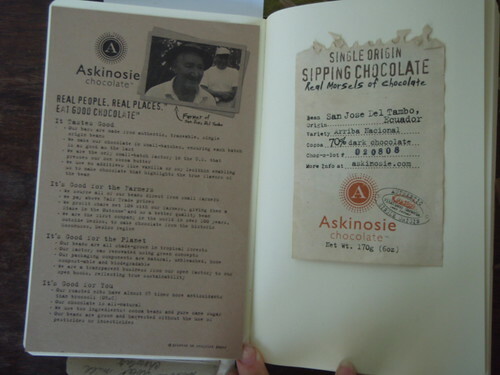 the sipping chocolate is packaged in a kraft tube with a big rubber band holding down the memo note (see image on right). you may want to try making mexican hot chocolate with this.